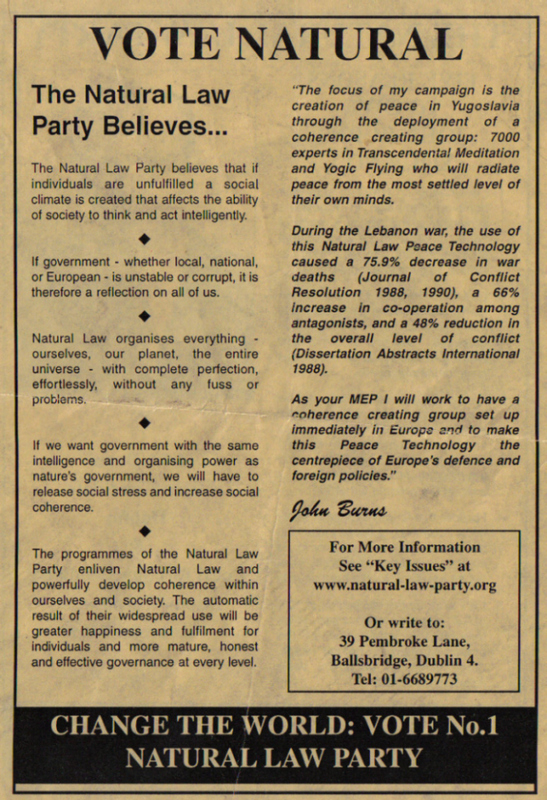 The text of a 1997 Leaflet produced by The Natural Law Party for the Westminster Elections…. JAMES ANDERSON was born in 1951 and holds an honours degree in Physics from Queen’s University, Belfast. After working in Astronomy for the Royal Observatory of Edinburgh he became a teacher of Transcendental Meditation. He is the Leader of the Natural Law Party of Northern Ireland and has worked on many projects promoting Natural Law programmes throughout Europe and the Far East. He is an established author and lecturer on the subject. Natural Law Party programmes can bring an end to the troubles in Northern Ireland very rapidly, as shown by the findings of worldwide published research on conflict resolution. The research shows that the collective stress in Northern Ireland and the resulting bitterness and intransigence can be dramatically reduced by establishing a permanent group of at least 200 local people practising the technologies of consciousness and Natural Law on a daily basis. The Natural Law Party views the source of conflict and distrust in Northern Ireland as lying deeper than race, religion, politics or paramilitary groups. The problem should be viewed not as Republicans fighting Loyalists or Protestants fighting Catholics, but rather as stress fighting stress. This will not be resolved by political talks alone – even with a change of government in London or Dublin. The long-term build-up of stress in individual and collective conscious-ness has distorted the way people think and live. The result has been tension, fear and violence associated with rigid mind-sets and deep distrust. The International Body on Arms Decommissioning recognised this deeper nature of the problems in Northern Ireland and in Paragraph 15 of their internationally applauded report stated that: “What is really needed is the decommissioning of mind-sets in Northern Ireland.” How to achieve this “decommission-ing of mind-sets” was the subject of the Natural Law Party’s 75-page submission entitled “Decommission-ing the Potential for Conflict”, presented to the International Body on 18 December 1995. The submission detailed 42 research studies which have demonstrated that a technology of consciousness exists which is capable of dramatically reducing collective stress and social conflict and creating a coherent, orderly, relaxed and positive collective consciousness. The scientific research, backed by prominent scientists worldwide, has shown that this transformation could be achieved by a coherence-creating group of people practising Transcendental Meditation and Yogic Flying on a daily basis at one location in Northern Ireland. As indicated by the research, the minimum size of the group should be about 200 people. Eventually, we would like to establish a permanent group of at least 1,000 Yogic Flyers, a sufficient number to create a unifying effect throughout the whole of Great Britain and both parts of Ireland, and ultimately a group of 7,000 Yogic Flyers, enough to create a positive effect world-wide. These larger groups will make the peace truly stable since the troubles are a result not only of tensions within Northern Ireland but of outside pressures and influences from many parts of the world. A coherent, relaxed collective consciousness maintained on a daily basis by establishing a coherence-creating group will free narrow mind-sets and end violent conflict. Common sense will replace intransigence and bitterness as happened in Mozambique, where peace was established after nearly 30 years of dreadful civil war, through President Chissano’s initiative to train coherence-creating groups within the military. In the resulting atmosphere of increasing trust and goodwill, dialogue will open at all levels of society, not just between political parties. Effective all-party talks could then take place from which agreed structures would emerge for a legislative body for Northern Ireland. Structures to strengthen the relationship between the two parts of Ireland could also be agreed which would enhance rather than threaten the relationship between both parts of Ireland and Britain. The Legislative Body should be elected by proportional repre-sentation. On convening, this body would elect an all-party cabinet which in turn would invite and appoint prominent successful people from Northern Ireland, those with the most relevant and established reputations, to head the various government departments. Ministers would delegate significant respon-sibility and authority for the management of the affairs of Northern Ireland to these prominent people. A similar system where ministers agree policy objectives but do not interfere in the day-to-day running of departments has already been successfully implemented in New Zealand. If this comprehensive approach to the situation in Northern Ireland is adopted then the immense positive potential of all the people will unfold and a government in tune with Natural Law can be established, capable of fulfilling the positive aspirations of all sections of the community. Your vote can rescue the destiny of Northern Ireland from the repeated failures of the old parties. In the Middle East: an International Peace Project resulted in very significant conflict resolu-tion, details of which were published in the prestigious Journal of Conflict Resolution in December 1988. In Mozambique: in the 2 years since its evaluation and implemen-tation by the Joint Chiefs of Staff of the Armed Forces the country has turned from a state of prolonged armed conflict to being one of the most peaceful and progressive nations in Africa (as reported in 1993 by the Commander of the armed forces, Lt. General Tobias Dai). In the USA: A National Demonstration Project in Washington D.C. reduced violent crime by 20% and significantly improved govern-mental effectiveness (as reported by the Independent Project Review Board). In the UK: A project in the Merseyside Metropolitan Area reduced crime by 60% compared to national trends over a 5 year period (published in Psychology, Crime and Law Vol. 2 number 3 1996). 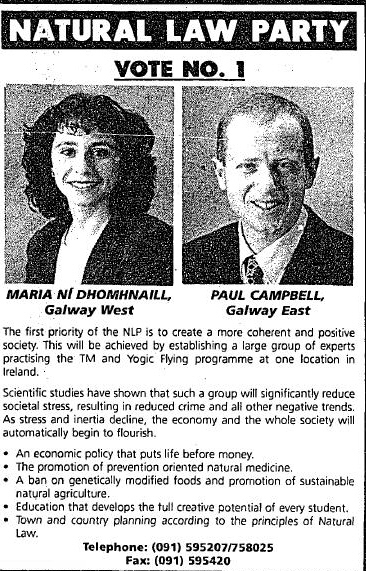 From the 1997 General Election Maria Ní Dhomhnaill and Paul Campbell who were running for the Natural Law Party in Galway East and Galway West. In Galway East Paul Campbell polled 98 votes whilst in Galway West Maria Ní Dhomhnaill polled 205 votes. They mention Yogic Flying as part of the solution to societies problems. From the 1994 European Elections in the UK a Party Political Broadcast on behalf of the Natural Law Party. Includes some footage of Yogic Flyers! 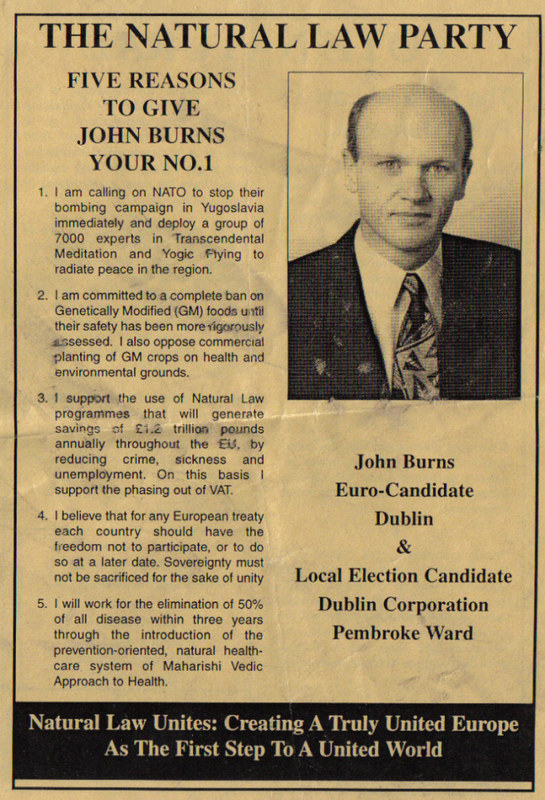 John Burns of the Natural Law Party from the 1999 European Elections in Dublin and 1999 Local Elections in Pembroke. He polled poorly in both. The Natural Law Party stopped fielding candidates in Ireland around 2000. Martin McAneny listed as the “Natural Law Candidate for Dublin South East” , it was actually Dun Laoghaire where he stood in 1992 gaining a massive 48 votes. Famously Paddy Seery of the NLP recieved 5 votes in the Birr Town Council elections of 1999, although had reached the grand total of 11 by the time he was eliminated.